I know that it seems everyone wants to blog about their experience with an Apple Watch, so why would I need to too? Well, I’m not a professional journalist (as if you can’t tell) – just an everyday person with an interest in technology, so perhaps I’ll offer a different perspective. So after 3 weeks, what does a ‘normal’ technology enthusiast think? 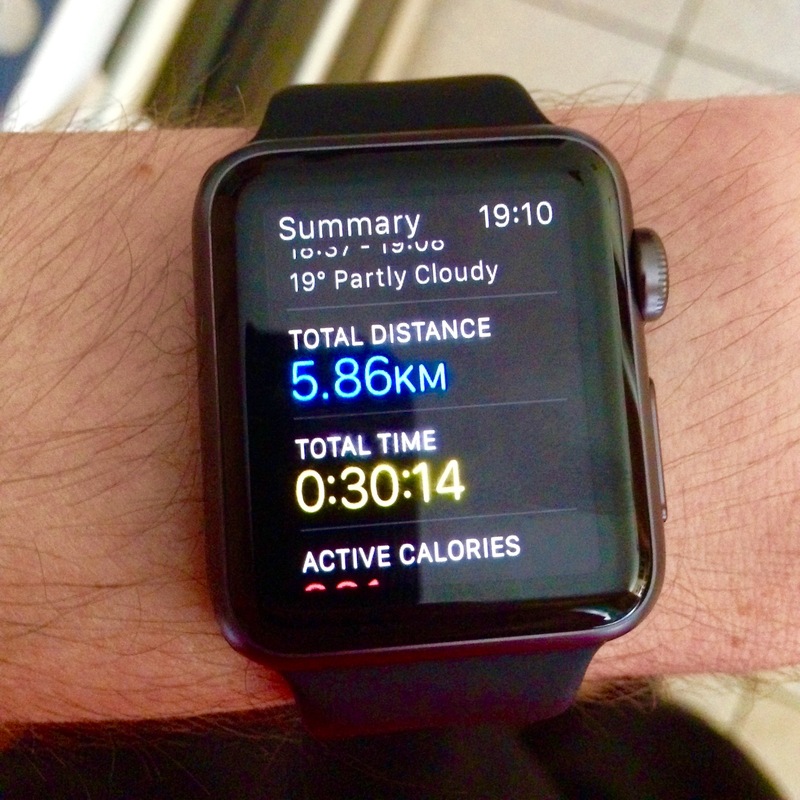 Well… I went for the 38mm black ‘Sport’ Model as I figured fitness would be my main usage scenario. I’ve always loved watches. Not for the bling factor – for me something being expensive doesn’t equate to it being stylish or useful. Ever since my Granddad introduced me to a Casio watch at the age of 8 I’ve loved a good gadget watch, and so the Apple Watch was right up my street. I actually have a Casio which I wear at weekends. It’s a radio controlled analogue/digital hybrid. I don’t wear it to work during the week since I’m usually at a computer all day long, it doesn’t really add much utility. So wearing a watch isn’t a habit I’ve had to get back in to. So a major factor in anyone’s purchasing decision is going to be ‘do you own an iPhone 5 or newer’ – if you don’t you can’t make much use out of an Apple Watch. My two and a half year old iPhone 5 still does the job (and until Apple increase the base storage from 16GB, I won’t be upgrading), so I was fine. The iPhone is needed for a number of things – most apps require the phone to either be in Bluetooth range or the watch to be on the same WiFi network as the phone. This is fine for me as my office has WiFi throughout the building, so I can easily leave my phone in a draw and walk anywhere in the office (even outside) and receive notifications – pretty cool. Some apps don’t even need your phone, they only need a WiFi connection. 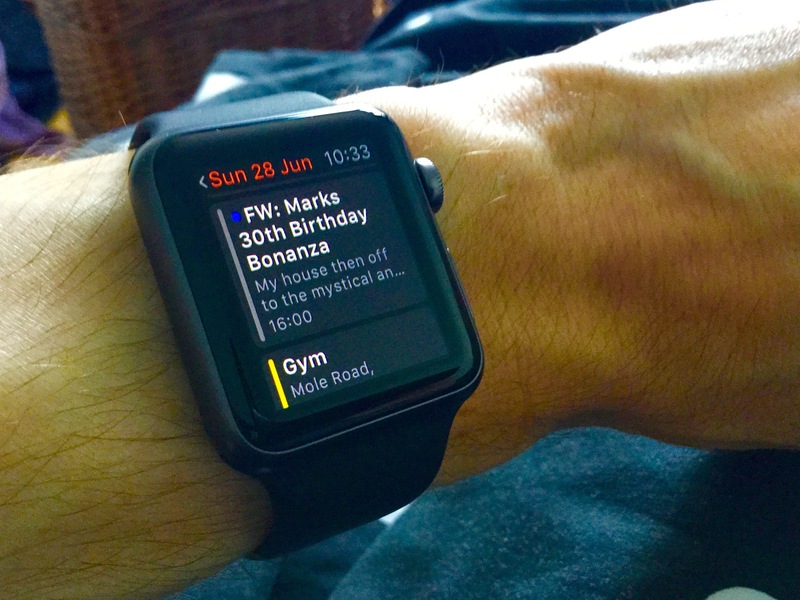 Messages is one of those apps – I left my phone in my car at the gym, but was able to send and receive iMessages from the watch no problem. Siri also works like this. Maps didn’t work, although it was able to determine my location (from the WiFi base station, I assume), just not show me the map. Overall the ‘need’ to be tethered to an iPhone is overstated in my opinion, though one thing to note is that the watch will only connect to a WiFi network your phone has previously connected to. So you can’t just head to a coffeeshop with only your watch and expect to get online. Most of the built in apps seem well thought through, though with some annoying limitations. I can reply to text messages, but not emails. Both the BBC News and Guardian apps only show me a paragraph before requesting I take my phone out. I’m sure people can make that choice for themselves, so why not show the whole article? If you use it like a watch, the battery will easily last you all day. If you use the Workout app or play with apps a lot, you’re going to struggle to get through the day. My Casio is solar powered, so I’m used to feeling the warm rays beat down on my watch and thinking about all that goodness it’s doing charging the battery, however that’s sadly not the case with the Apple Watch. If anything the heat will kill the battery’s longevity. I do hope Apple add solar charging in future iterations. It seems to be pretty accurate (once trained by running outside with your phone’s GPS). I tested it on a treadmill and it was a few percentage points out. I have a tendency to rest on the side of the treadmill for 10 seconds while I switch tracks, it knows I’ve stopped running unlike a treadmill. The ability to leave you phone at home when you go for a run is great, you can play music from the watch via Bluetooth headphones. Unfortunately changing a track while running is not easy (it made me pine for my iPod classic). You have to exit the ‘Workout app’ by pressing home, tap the Clock icon and then swipe up to get to glaces, then swipe across to the ‘Now Playing’ glance. You could also open the music app from the home screen, but it’s way too complex and an odd oversight from Apple. The daily activity goals are good, however the recommendations are a bit basic. For example I had a daily active calorie burn goal of 400 – On 5 out of 7 days in a week I exceeded it, however it took my average calories over the entire week and suggested a new daily goal of 220 (I had a very lazy weekend). It seemed more logical that it would know that a lot of people will have different behavioural patterns on weekends and suggested something a bit more realistic. 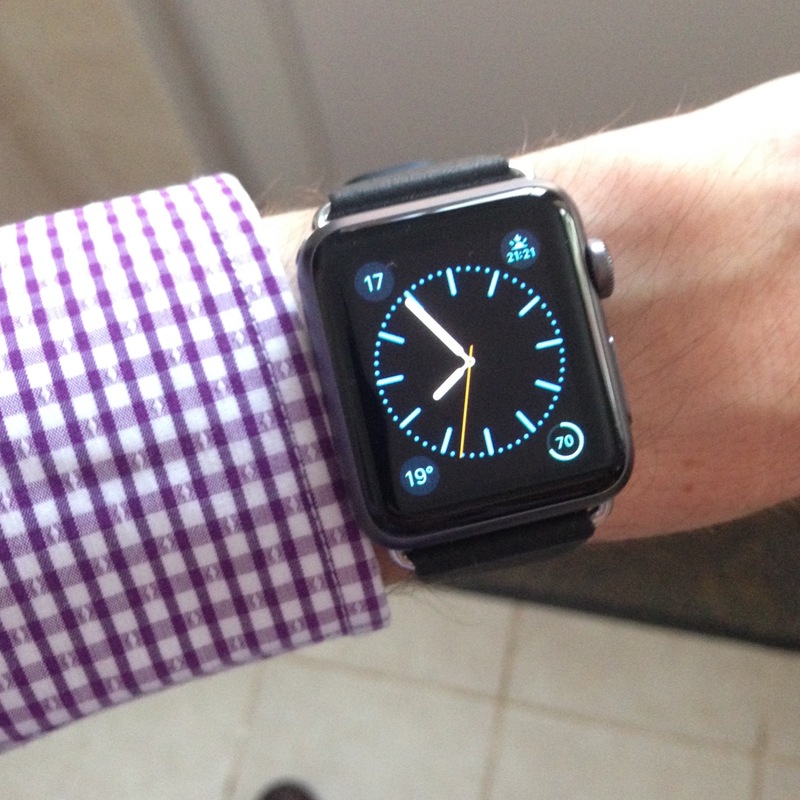 I went for the cheapest option, the black Sport model (I went 38mm not for price but because I have skinny wrists). I looks pretty nice, even with the leather buckle. I probably wouldn’t wear it to a formal occasion such as a wedding, but for business, or social it’s absolutely fine. The best thing about notification is I never have to check my phone any more, since I know I will have gotten a tap on the wrist if anything of note has happened. I had to make sure all but the most critical apps were turned off however, I don’t really want to be interrupted because someone followed me on Twitter. The only way to input text is via voice-dictation. This is fine if your a technology journalist who works from home, or an exec who has their own office – but for the average person who works amount other people (this applies to social occasions too), it’s not polite to start dictating messages to your girlfriend in front of other people. I value my privacy, and so unless I’m alone I generally don’t enter text into the watch. What this device really needs is a way to enter text, Microsoft have the right idea, and I’m disappointed Apple haven’t even included this in watchOS version 2. (I guess it did take the iPhone OS 3 iterations to get copy and paste). 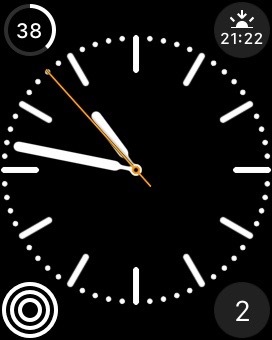 One of the coolest things about the watch is the customisable watch faces. You can add widgets that show the weather, sunset time, battery life, next appointment and more. In this sense, the watch really has utility that makes it worth wearing. I can look down on my wrist and see my next appointment or the current weather conditions. 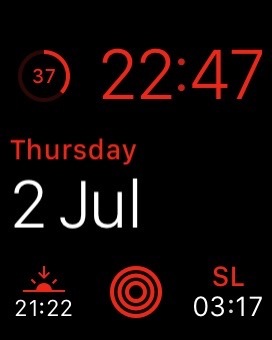 This is the one I use when I’m not at work – it shows me sunset time (how much time I have left to go out for a walk or run before it gets dark), the battery level, the day of the week and my activity for the day. When I’m at work I like to use this face, which gives me the timezone of our other office, in addition to putting the date front and centre.